Fans of Sci Fi’s popular Battlestar Galactica TV show are looking forward to the last episode, but they’re also dreading the void that the series’ absence will leave. Though the network is moving ahead with the prequel series Caprica, it will take place 50 years before the current show so the traditional characters won’t be part of it. News has now leaked out that a Battlestar Galactica movie is in the works. Curiously, it won’t be based on the current series. Why? Well, that’s a bit complicated. 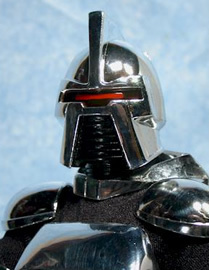 Created by Glen A. Larson, Battlestar Galactica (BSG) centers around a colony of humans from a distant star system. They’re constantly under attack from warrior robots called Cylons that had been created to fight a war, and never programmed to finish it. Eventually a group of survivors escape and begin searching for a mythological planet called Earth. The series features performers like Richard Hatch, Lorne Greene, Dirk Benedict, Herb Jefferson Jr., Laurette Spang, Terry Carter, John Colicos, Tony Swartz, Maren Jensen, Noah Hathaway, David Greenan, Patrick Macnee, Anne Lockhart, Sarah Rush, Felix Silla, and Jonathan Harris. The show began in 1978 as a big budget series on ABC. Capitalizing on the success of the film Star Wars, the pilot was given a record-setting budget. Though BSG had a huge debut, viewership waned as the series progressed. Though it often won its timeslot, the ratings weren’t likely high enough to justify the production costs and it was cancelled in April 1979. Fans protested and a theatrical version of the pilot was released in May 1979. After its cancellation, an impressive write-in campaign took place, and Larson crafted a sequel series. The spin-off Galactica 1980 is set several years after the original series. Several familiar characters were written out of the story to help control costs. Interestingly, only one of the stars who were included signed on. Greene returned but Benedict was unavailable and Hatch read the script and declined. Utilizing unused footage from the original series, Benedict’s Starbuck character returned in a flashback episode but it wasn’t enough to save the show. Production was halted midway through episode 11 and only 10 episodes of Galactica 1980 aired. Hatch wasn’t done with BSG by any means. He began writing novels based on the original series, disregarding the 1980 sequel. These were well-received by fans, leading him to then craft his own sequel series, The Second Coming. Hatch produced a trailer to drum up support in the late 1990s. While he had the support of fans, Universal Studios wasn’t interested. Are you interested in seeing Larson's BSG movie? Nah. That time has past. Larson also didn’t approve as he still had his own ideas for the BSG franchise. The movie rights had reverted to him. The TV rights remained with Universal but the studio wasn’t interested in producing a new series just yet. Around the time that Hatch was originally trying to sell his idea, it was announced Larson was planning his own $40 million film, sending Larson and Hatch into a war of words. Interestingly, Larson also wanted to abandon the 1980 version and was crafting the movie as a continuation of the original series. Eventually, Universal moved ahead, without involvement of either Larson or Hatch. 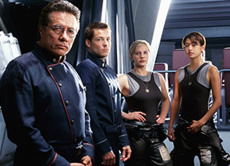 BSG returned to TV as a mini-series and then a regular series on the Sci Fi Channel. As a reimagined show from Ronald D. Moore, the concept and character names remained but none of the original actors returned. Both Larson and Hatch were openly critical of the series but Hatch eventually came around and accepted a recurring role as political leader Tom Zarek. Because the original concept was his, Larson felt he deserved a credit on the new version and went to arbitration at the Writer’s Guild. Moore agreed with him but the studio didn’t. Ultimately, Larson was credited on the mini-series under the pseudonym “Christopher Eric James” and is credited as a consulting producer on the current series. As the reimagined show is ending after four seasons, 71-year-old Larson apparently feels the time is right for a return to his original vision. He’s in talks with Universal to do a movie, based on the original series and not Moore’s current cult favorite version. It’s unknown if any of the surviving original castmembers would be invited to take part. Though this news has produced a lot of strong feelings among the fan community, it still remains to be seen if this new movie will ever get off the ground. Though Universal would potentially profit from the project, the studio hasn’t been very supportive of his revival ideas in the past. Having two very different versions of BSG coming out at the same time would be confusing to casual consumers to say the least. Still, it may end up being a gamble that the studio is willing to take, eyeing the success of the Star Trek movies featuring the original cast or the upcoming prequel blockbuster. By working with Larson on this movie, it could pave the way for a feature film franchise based on Moore’s reimagined version. What will become of the BSG franchise? Time will tell. Come on..the original show was so hammy it was rediculous. Lorne Greene and his bad toupe’s…the horrible last couple of seasons set on earth…that annoying little robot…and that kid. thank god it was cancelled and put out of its misery. Now the remake..much more dark and gritty and serious…much better drama. Great actors..and they even brought back one of the old original guys. I grew up on the original series..but the reboot was so much better! I would love to see the continuation of the original BSG A show based on the original actors and their children…something along the lines of The Second Coming would be wonderful. But i know they have other ideas….please at least bring back the original Actors who fought so long and hard for BSG fans. Give us Starbuck and Apollo…please! I would be first in line to see a continuation of the original! The bottom line is that the cost was too high compare to what ABC was making back. If the show got bigger ratings, they would have continued to air it, no matter if the executives understood it or not. The networks are businesses that are looking at the bottom line, nothing more. I can’t wait to see this film! Brian Singer and Tom DeSanto really are the right people for the job. Heck, most of the defining moments of the Ron Moore series came from their continuation ideas! I’m sure they’ll go in a new direction though. Its about fracking time this movie got made!